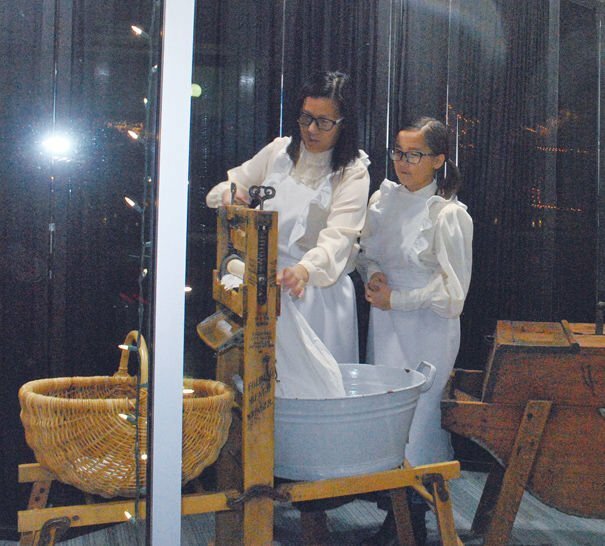 First place Victorian Theme, Laundry Day at Cosby’s US Cellular, Ar and Zoey Zanoni. Judge’s Choice first place, Alice’s Victorian Wonderland at Transform Academy. Festival of Trees first place, “65 Roses” by Pat and Mary Ann Crall family. The weather forecasters were spot on when they said there was a 100-percent chance of rain on Saturday. It rained and snowed off and on pretty much all day. But it didn’t dampen the enthusiasm of those participating in Victorian Stroll activities. Crowds around the square at the beginning of the Stroll were a little smaller, but as the rain let up, the crowds increased. There were packed crowds at the Breakfast for Santa and the King Opera House was jumping all day long with a big crowd for the children’s movie and then a standing room only crowd for “The Nutcracker” performed by Shannon’s School of Dance. Winners of the window and Festival of Trees competition included: Victorian Theme, first, Laundry Day at Cosby’s US Cellular; second, Ironing Christmas Linens at Blackbird Primitives; Judge’s Choice, first, Alice’s Victorian Wonderland, Tumbletime Academy; second, Silent Night’s Gift, Summers Insurance. Festival of Trees: first, 65 Roses Pat and Mary Ann Crall Family; second, Pretty in Pink, AL-B-IA Good Dog; third, Snowmen Galore, Cloey Burkman.